Everything Changes – The Guide to Young Adult Cancer » Tips for Dealing with Family When You’re Sick? Tips for Dealing with Family When You’re Sick? I’m glad to be celebrating Passover with my family and getting a reprieve from thinking about healthcare reform. Waking up in my parents’ house got me thinking a lot about how much I love them and what it’s like dealing with family in general when you’re sick. 2. Don’t express to everyone how you are feeling and what you needed. Some relatives have made asinine comments to me and I let it go. You can pick your friends but not your relatives and I know when it’s futile to spend my limited energy trying to get someone to look outside of their bubble into my world. Emotional walls and superficial conversations are sometimes great devices. And remember, just because a family member offers to help you out doesn’t mean you have to accept it. 3. Arrange for alone time. I was damn grateful for the love and support I had, yet I knew I would go stir crazy without a little time to myself in my tiny studio apartment. If your family is from out of town, ask your friends to take them out to a movie or to dinner so you can get some space. Chances are your family members need a break too. 4. Bring in outsiders. During my first treatment it was just me and my mom. The second time around we mixed it up with my aunt and dad coming out too. It was great to have friends stop over to be with all of us and to have my Rabbi drop in too. There was a lot of nervous energy flying around and we loved an outsider to come and divert our attention. Has illness impacted your relationships with family members? What tips do you have to add to my list of how to manage family relationships during illness? 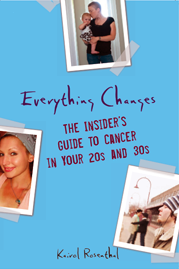 Read Everything Changes: The Insider’s Guide to Cancer in Your 20s and 30s to learn how and why Seth successfully asked a sibling instead of his parents to come take care of him. I think another one could definitely be keeping your family and friends informed about your disease. A lot of times they have no idea what it is and can’t really say the “right” things unless they know what’s going on. Maybe letting them ask you questions, whenever you’re ready, would really help them hear what’s going on from you and not just from WebMD or any other website with random information. :-) Hope all is well with you, Kairol! Happy Passover! My family was already a bit narcissistic, and my stage 4 cancer diagnosis and immediate hospitalization only amplified that. My mom didn’t want to fly out to see me because “it was raining”, my sister was in rehab for the millionth time, and my brother the doctor was busy at work. That first day was a pretty good indicator of how the next 2 years of help from family members would pan out. Luckily I had a great guy who stuck by me the whole time, which made me realize he was an even greater guy. Not too many girls fall in love in a hospital bed. 5 years later, cancer free , still with great guy, and very happy. One thing I found that helps – I’ve been dealing with cancer for three and a half years now – is having a support system outside of family. During the first intitial phase, and after surgery or treatment, my family is great. But the rest of the time, I need someone else to talk to. My husband takes much of my complaints and helps me more than I can say, but he has his own emotions and trials too, same for the rest of the family. I started going to a “women with cancer” support group and I can’t tell you how great it’s been to have outside support! Dori – I think you really nailed it with the communication component. I think a lot of people don’t really get what is going on with us when we are sick, and ever so unfortunately they cannot be mind readers. We have got to tell them. I feel like communication glitches account for so many relationship problems whether you have cancer or not! I think I might be the only person in the world who hasn’t told her own parents about her cancer diagnosis. :P From growing up, I know that my parents, esp my mom, would totally freak out if she ever found out about my thyroid cancer. She would try to control every last food item that I put in my mouth and would probably try to come live with me (uninvited). With my work and life, I couldn’t deal with any of that drama during and around my surgery, which was over 3 months ago. Now, though, I wonder how long I can keep this secret from them. Any thoughts or advice on breaking this type of news ‘after-the-fact’ would be appreciated! Or, validation that it’s OK never to tell your own parents?! Thanks for your comment. It is a really important one. I ache for the decisions you are facing around telling your parents. Instead of writing a reply to your comment, I thought the topic merited a blog post of its own. Please read my post just up on April 2, 2010 called Hiding Cancer from Your Parents. Keep me posted on how you are doing. You are in my thoughts big time!